Torch Lake has long been one of the most sort after “Up North” destinations with National Geographic Magazine rating it as one of the most beautiful lake in the World. The cottage has four bedrooms arranged as 1 king, and 3 queens comfortably sleeping 8 people. The cottage is on the east side facing west, therefore we enjoy amazing sunsets. We have 180ft of lake frontage and dock that give easy access for boating on Torch and interconnecting Elk and Bellaire lakes. 15 minutes away Shanty Creek is great for skiing, snowboarding and tubing. 45 minutes away Boyne Resorts provide excellent skiing and tubing in the winter, golf in the summer and Avalanche Bay water park. For those that prefer a more leisurely pace Alden is a short walk away, boasting quaint antique and gift shops and the not to be missed Higgins Store famous for its ice creams. The cottage is available for weekly rental Saturday to Saturday all year round, long weekends available by request. Find yourself sitting by the fire pit watching the sun go down over beautiful Torch Lake. We are Zoe and Tony Booth, we have 4 children and live in Bloomfield Hills Michigan Originally we are from London England and 15 years ago my husband was offered an advertising job here. Our cottage is in a great location for short tubing rides on the boat, longer day trips to Elk Lake or just popping up to The Dockside by boat for dinner. Bike rides into town to play tennis and get an ice cream is all part of our stay. In the winter we enjoy our cosy weekends in the cottage skiing and tubing and coming back home to the cottage to sit by the fire and relax. The lake is so dramatic in the depths of the winter, we spend many weekends enjoying skiing and walking. Beautiful house and property on Torch Lake that served as a home base for a family ice fishing trip. Very quaint older cabin with updated kitchen. Very comfortable beds. Loved the family room with fireplace. We were there over New Years and Zoe was very hospitable by making shovels available to us as we got about 8-10 inches of snow on our last night there! This is a lovely vacation home situated on the east side of Torch Lake near the picturesque village of Alden. The property is private, well-screened from neighbors, with lots of lake frontage and a wide porch for sunset viewing. The kitchen is updated and well-equipped, the living space is attractive, and the beds are comfortable. One can tell this has been a summer family home that has known a lot of love. Our thanks to Zoe for being so accommodating to our every need and request. We enjoyed our stay here and hope to return in 2019. This cottage was perfect for our group of 6 (girls trip). The house was clean and everything was as advertised. The bedrooms and bathrooms are small but sufficient. The kitchen and dining room were spacious. The most amazing part is the location, the large yard, the dock over the water, the fire pit and of course, it is right on Torch Lake. The cottage is old and you can still tell some of the floors are original so it is squeaky! It is hard to tiptoe when others are asleep. That didn't bother us at all though. It has the large covered patio with plenty of seating and a cute 2-seat swing. We had a total blast here and all have agreed this was the best vacation spot so far! We hope to come back and visit soon. The owners were fantastic and super responsive. Very nice. We had a great time! 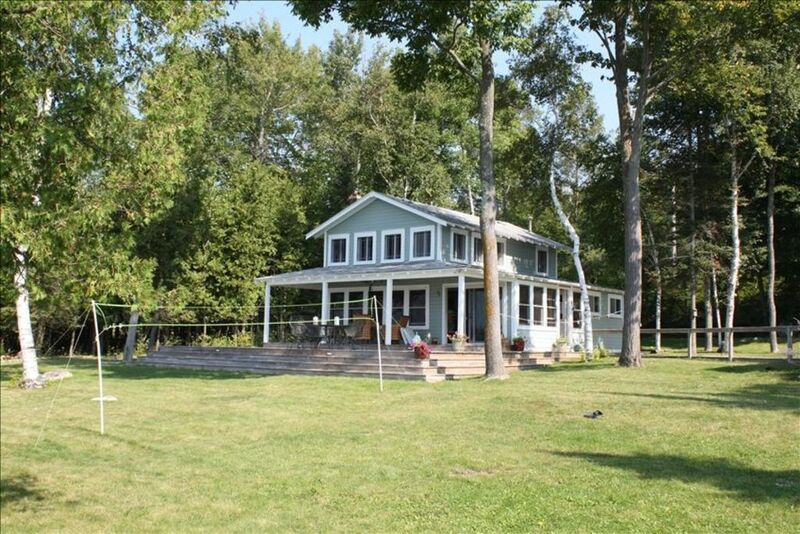 Beautiful home in a perfect location for being on the lake! Owners were very friendly and helpful!